No swatches for Julep Brandt yet! House Stark of Winterfell. I tried to capture the cold snow from Winterfell with a gray-dark gray gradient and sponged some medium-small sized glitter for the snow. 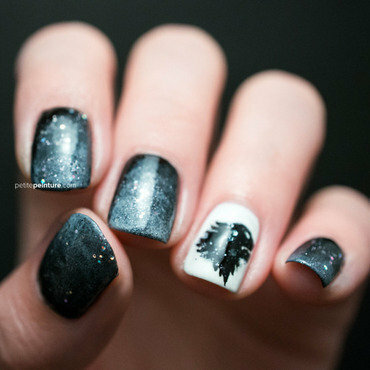 On my accent nail, I painted the direwolf in black and topped it with some subtle hex glitters to mimic the snow effect.